The Best Beach in Massachusetts! 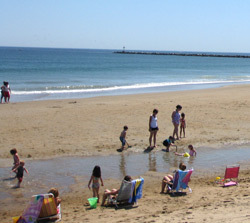 Salisbury Beach extends from the mouth of the Merrimack River to the Massachusetts/ New Hampshire border. 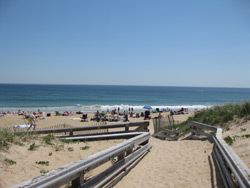 Unless you are renting a house or condominium in Salisbury the best access to the beach is via Salisbury Beach State Reservation. For a $14 (Ma Residents)/$16 parking fee you are provided with a parking space, access to restrooms, and a beach where there are lifeguards to protect you and your loved ones while you are swimming. This means your potential day-at-the-beach problems are greatly reduced. Of course this doesn't eliminate one of the biggest challenges - how to get all those supplies (chairs, blankets, cooler, etc.) from the car to the beach! 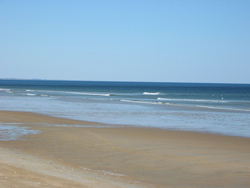 You can also access the beach from the main access route of Beach Road / Broadway. This is where the shops, arcades, and places to eat are found. There is some parking here too, except here you pay by parking meter. There are a few shops in Salisbury if you need to pick up some last minute beach supplies. Once you do arrive at the park you can find a parking spot in one of the three large car lots (you are required to pay a $14 (Ma Residents)/$16 parking fee from Memorial Day - Labor Day). There are bathrooms, changing stalls, and outdoor showers at the newly constructed "comfort stations" - there are three of them scattered around the edges of the parking lots. A number of boardwalks lead out of the parking lots, over the dunes, and onto the beach. If you have small children it can be a really nice moment to catch the look on their face when they reach that spot on the boardwalk where they first get a view of the water. 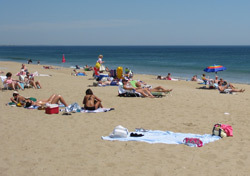 There are lifeguards stationed at Salisbury Beach from Memorial Day through Labor Day (weather permitting). They are on duty from 10 AM until 4:45 PM. There are 5 guard chairs along the state reservation beach and 4 chairs along the beach adjacent to the arcades, shops, and restaurants. No, no, no - pets, motor vehicles, camping, floatation devices, alcohol, glass containers, or fires are permitted on the beach. Be careful when you are swimming. If you are going to swim in the ocean you should known about rip currents, swimming safety, and what to do if you are caught in rip current. When there are lifeguards on the beach they will usually steer you clear of such problems. If you swim at an unprotected beach it is really important that you take a few minutes to learn how to avoid or escape this potentially fatal situation. Stay off the dunes! When you are walking from the parking lot to the beach use the boardwalk. The dunes protect and stabilize the beach and walking on them can kill the plants (read more about barrier island sand dunes). You are only permitted to swim in the ocean, and only from the ocean front beach. Do not swim on the south side of the jetty or from the shore of the Merrimack River.